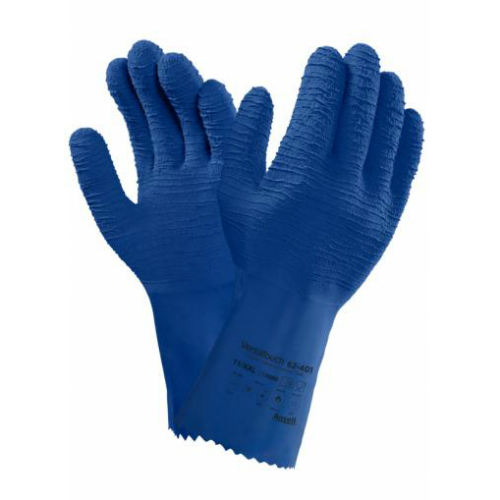 Designed to protect your hands from an array of hazards, from cuts and abrasions to contact heat and dangerous chemicals, the Ansell VersaTouch 62-401 Insulated Latex Gauntlet Gloves are the perfect choice for anyone working in construction, food processing, glass industry or public utilities. Comfortable, dexterous and flexible, you can wear them for extended periods without tiring your hands. The VersaTouch 62-401 Gauntlet Gloves are designated Category III gloves, meaning that these are gloves of complex design, suitable for irreversible or mortal risks. The VersaTouch 62-401 Gauntlet Gloves are available in five sizes that should suit the hands of most users. Please measure the circumference of your hand around the knuckles (excluding the thumb) with your hand open and your fingers together, and the length of your hand from the tip of your middle finger to your wrist.